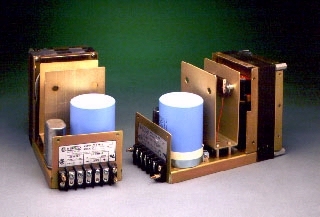 These units are modular ferroresonant voltage stabilizers which obtain their source-isolated, overload-protected output from Kepco's proprietary transformer, Flux-O-Tran. This design lends itself to custom volt-ampere combinations, consult factory. The low cost, highly dependable ferroresonant stabilizing technique provides extraordinary isolation from a wide variety of source noise. The d-c output is inherently short-circuit proof and cannot expose delicate loads to over-voltage hazards, see Figure 7. Hence no crowbar, fuses, or bounding circuits are needed in the output. Conventional input circuit protection is required. Ferroresonant power supplies use no noise-producing switches or oscillators. Voltage setting is independent of delicate control settings or diode references, and requires no comparators, references, or limiters. Efficiency is 65-75%. PRM's are available in fault tolerant configurations. Consult factory for configurations to meet your requirements. Rack-mountable versions with meters, railroad-style output studs, and d-c output monitoring are options. PRM are CE Marked per the LVD, EMC and RoHS 2 Directives. See applicable Declaration of Conformity.